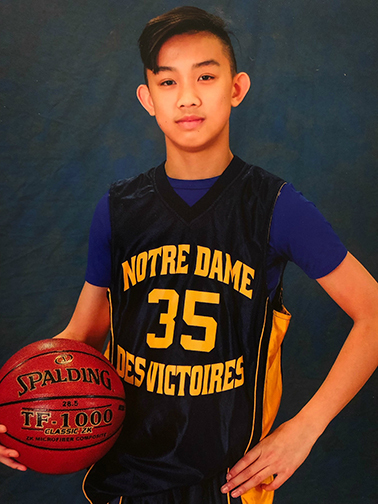 Congratulations goes to eighth grade student Marcus L., who was selected to represent NDV at the annual 8th grade boys’ Basketball Achievement Series. Marcus was chosen for showing team spirit and cooperation with coaches and teammates and for reflecting well the spirit of CYO sports. The game will be played on Sunday, February 10th, 2019 at Saint Ignatius College Preparatory at 2:00 p.m. Congratulations, Marcus! Aside from being a great basketball player, here are some fun thing to know about Marcus. Science because there’s so much to discover. Learning science can be fun because there are many hands-on projects and experiments. Right now, our class is working on a roller coaster project. When the boys team won both soccer and basketball CYO championships in 5th grade. It was a huge accomplishment because we were undefeated in both sports. A cheetah because they can run very fast and it would be a fun experience. Playing basketball. I’ve played basketball since I was 4 years old and I really enjoy it. Currently, I play for three teams: SF Flying Eagles, Bay City Select, and NDV. I wouldn’t want to change my name because my grandpa helped pick it out. I would travel to Japan. I find Japanese culture and food very cool. I also would like to see the many different things there that we can’t see here in America.